Added by admin on March 29, 2018. France’s far-right and far-left leaders have been booed during a Paris rally after a Jewish woman was killed in what is being treated as anti-Semitic crime. Marine Le Pen of the National Front (FN) and Jean-Luc Mélenchon of France Unbowed joined the silent march, defying wishes of Jewish groups. The groups accuse the two parties of having anti-Semites in their ranks – a claim denied by both organisations. Mireille Knoll, 85, was stabbed and then burnt in her Paris flat on Friday. As a child in 1942, she evaded the notorious Vel d’Hiv round up of some 13,000 Jews in Paris, who were then deported to Nazi death camps. Two men have been held and placed under formal investigation over her murder. A police source told French media that one of those detained had previously been convicted of molesting a 12-year-old girl who had been staying at Mireille Knoll’s flat. She had also complained to police that a neighbour had threatened to set fire to her home, according to reports. On Wednesday, Ms Le Pen and Mr Mélenchon met a hostile reception from a number of protesters marching from Paris’s Place de la Nation to Ms Knoll’s apartment in the east of the French capital. The two political leaders had to leave the rally as tensions threatened to boil over. 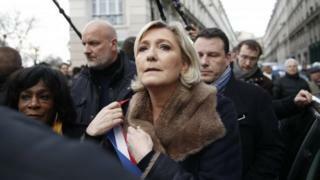 Ms Le Pen later rejoined the protest, the AFP reports. Ahead of the rally, Crif, an umbrella organisation of France’s Jewish groups, asked the far-right and far-left politicians not to join the event. “Anti-Semites are over-represented in the far-left and the far-right, making those parties ones that you don’t want to be associated with,” Crif director Francis Kalifat told RTL radio. “Therefore they are not welcome,” he added. Ms Le Pen – whose father and predecessor as FN leader, Jean-Marie, is a convicted Holocaust denier – was quoted by the AFP as saying that Crif leaders “have got the wrong enemy”. “We’ve been fighting Islamist anti-Semitism for years,” she added. Several senior government members took part in the protest. President Emmanuel Macron attended Ms Knoll’s funeral earlier in the day. France’s Jewish community has voiced increasing concern over a rise in violent anti-Semitic acts in the country. Last month, a judge confirmed that the murder last year of Sarah Halimi, a 65-year-old Orthodox Jewish woman who was beaten and thrown out of her window, was driven by anti-Semitism.